Magistrate Consuelo Scerri Herrera has filed an application in court withdrawing her criminal libel and defamation proceedings against blogger Daphne Caruana Galizia. In her application, Magistrate Scerri Herrera said that her complaint had been based principally on allegations regarding drugs and corruption. With regard to the former, Mrs Caruana Galizia had written that she (the magistrate) "throws parties at which plenty of talcum power is thrown around, for example, but she does not use talcum powder herself. She uses deodorant." It had also been written that: "People would like reassurance that those who sit in judgement over them do not lead lives of debauchery while developing property as their main line of business, or throwing parties where talcum power is a main feature of the event." 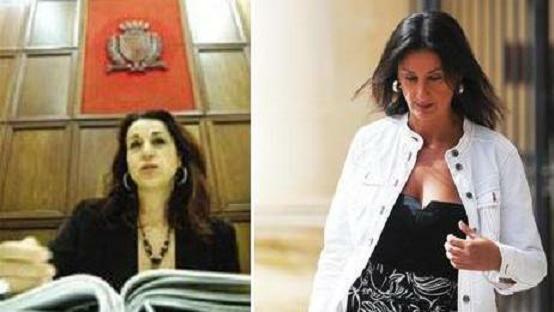 The magistrate said that in her evidence on the case last September 6, Mrs Caruana Galizia had said that: "I want to be clear, I am sure that the complainant (the magistrate) does not do drugs, never has, and as far as I know, she is not the type...she does not even drink, and my remarks were not addressed at her." Later she said that she wanted to make clear that she never implied that the magistrate was involved in drugs and talcum powder was not cocaine. As for the alleged corruption, Magistrate Scerri Herrera recalled that Mrs Caruana Galizia had written "shouldn't you be finding out whether the magistrate pays for her jewellery and catering?" She also wrote that: "It is what happened to Noel Arrigo, who should have served as a salutary example but didn't. The irony is that Arrigo went down for a fraction of what certain other persons are up to, because his position was the highest and he was stupid enough to take a bribe directly rather than to have suppliers pay for the catering at his parties, or expensive jewellery sent to his door, or cuts on major development deals." In another section, Mrs Carauana Galia wrote: "When magistrates behave like this, and hand the threat of police investigation over those members of the press who speak and write about what they do, so that the boundaries are pushed further and further, the inevitable result is Noel Arrigo - and he is beginning to seem tame." The magistrate noted that on September 6, Mrs Carauana Galizia said that "she (the magistrate) was offended because she thought I had compared her to Noel Arrigo. I did not compare her to Noel Arrigo, God forbid that we reach a state where we suspect that she can take a bribe from a drug trafficker. I swear that I do not think that is the case." Later she said "I know she will not take a bribe, I am saying the opposite, I am saying that I know her and she will not take a bribe from a trafficker." With regard to the Commission for the Administration of Justice, the magistrate said that Mrs Caruana Galizia had written that - "You would have thought that after the major tip-off I gave them yesterday, MaltaToday would have picked up the story of how Consuelo Herrera is being investigated by the Commission for the Administratin of Justice, which has received reports of alleged corruption in real estate deals"
Then on September 6 in her testimony, Mrs Carauana Galizia said: "I did not need to make any verification, as my point was about the complaint to the Commission. I did not need to act like an investigating detective. That is the work of the Commission, and I am awaiting the outcome of the Commission's work." The magistrate said that Mrs Carauana Galizia did not need to wait any longer about the alleged corruption in real estate deals as it had been decided, last September, that in her regard, no shortcomings had been found by the commission and she, therefore, was not censured. The magistrate said she regretted that Mrs Carauana Galizia made no verification before proceeding 'with her defamation' but in the light of what Mrs Caruana Galizia had declared, she had no further interest to proceed with the case. The matter will be dealt with court on Friday. Lawyer Roberto Montalto, who is appearing for Mrs Caruana Galizia, told timesofmalta.com that his client had, in her testimony, not withdrawn any allegations but simply explained what she meant in the blogs. Writing in her blog today, Mrs Caruana Galizia said the magistrate’s decision came after she (Caruana Galizia) had submitted her list of witnesses. “The only way to avoid having certain witnesses take the stand at this late stage is to stop the case altogether,” said said. Mrs Caruana Galizia did not say who was included in her list of witnesses. Informed sources said the list included Former Chief Justice Vincent de Gaetano, Opposition leader Joseph Muscat and the magistrate’s partner Robert Musumeci. "So I accept that Magistrate Herrera needed to save face, though I think it was a mistake to give spurious reasons instead of just doing the sensible thing and saying ‘I withdraw my complaint’ and leaving it at that, "Mrs Caruana Galizia said.